A Bunnell motorcyclist was seriously hurt in a crash with an SUV at the intersection of Belle Terre Parkway and State Road 100 shortly after 8 p.m. this evening (Jan. 19). 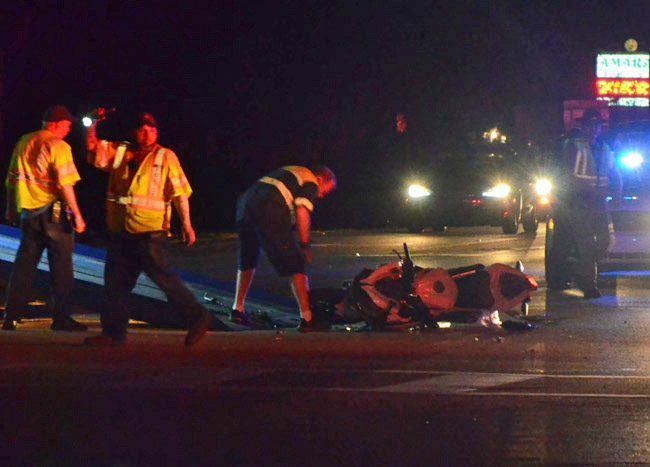 Westbound traffic on State Road 100 was shut down at the intersection, as was southbound traffic on Belle Terre past State Road 100, until a wrecking crew could clear the motorcycle from the scene just after 9 p.m. The Florida Highway Patrol is investigating the crash. According to a trooper, a man with a passenger was at the wheel of an Isuzu Rodeo, driving west on State Road 100. He had a green arrow to make a left turn, to go south on Belle Terre. The motorcyclist was going east on 100. According to what the driver of the Rodeo told the trooper, the motorcyclist ran a red light, striking the front passenger side of the Rodeo. The motorcycle ended up on its side in the intersection. The Rodeo stopped on the west shoulder of Belle Terre, a few feet south of SR100. The driver of the Rodeo and his passenger were not hurt, though the driver was shaken up. Flagler County Fire Rescue, the Palm Coast Fire Department, Bunnell police and sheriff’s deputies all responded, along with FHP and the Palm Coast Fire Police, which regulated traffic around the intersection. I hope the motorcycle person is going to be ok. i will pray for you. I lost my son in law to a motorcycle crash when he was only 31. I hope that the motorcyclist recovers quickly. Over the past few months I have seen numerous motorcycle riders disregard traffic laws and violate right of ways. I never ever see Law Enforcement pull them over. Yet I see plenty of vehicles pulled over for infractions. You can’t turn the radio on now without hearing from Ru and Ziffra or some other ambulance chaser promoting bikers rights and wanting to sue motorists at the drop of a hat. I see all these stickers that say look twice save a life. Could it be that maybe bikers need to use a little more caution on the roads? This is the second or third serious incident where the biker was at fault. I’m not saying all bikers are bad but maybe bikers need to slow down a bit and obey traffic laws. That way we all get home. Lastly we see another case of out of county air support having to be used. This is due to inadequate coverage of Emergency Services in Flagler County. When does the BOCC plan on rectifying budget issues and restoring Fire Flight back to 24 hour service? It takes time for dispatch to notify an out of county helo and get them spun up. Then it takes them time to arrive on scene and load the patient. On a trauma alert seconds matter. We will unfortunately see a case one day where there will be a fatality due to not getting a trauma flight in time. Motorcycle versus large vehicle, which one is going to win when both are trying to occupy the same space? Yup, you’ve guessed it. Which means that EVERY motorcycle driver needs to pay EXTRA attention to their surroundings at ALL times plus anticipate what might happen IF. 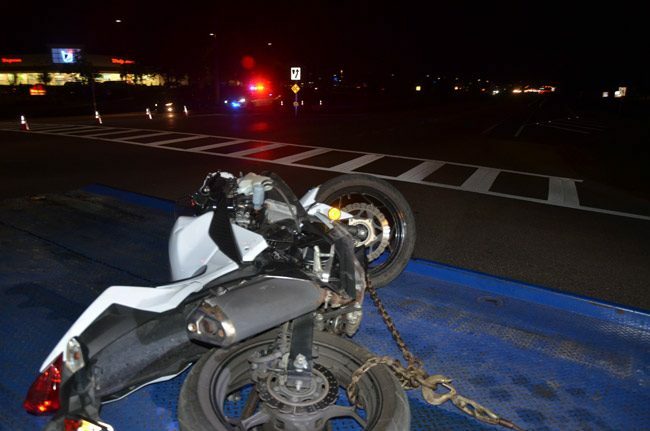 Hope this guy survives to ride again but will have learned his lesson about traffic laws. When you push the envelope and run a red light someday it will come back to bite you. Need a round about or traffic light at that intersection,like I said traffic control devices don’t fix bad driving. Thankfully everyone is going to be okay. But we see all the signs “watch for motorcycles”. What about the bikers who run the lights, pass in between cars & down the shoulder of the road & speed down the roads swerving in & out of the lanes of traffic? Shouldn’t they obey the laws too? Maybe once Sally Sherman and others leave the BOCC could utilize some of that friviously spent money and restore Fire Flight back to 24 hour service. As large as a county Flagler is and the amount of trauma alerts happening after 8pm surely warrant that expense. One of the BOCC’s job should be to ensure that Flagler County has adequate emergency services coverage. Not over paid illegally double dipping assistants. Life flight when a hospital is 2.2 miles away? lets put another round-about in! Lets put them everywhere! PEOPLE LEARN TO DRIVE! 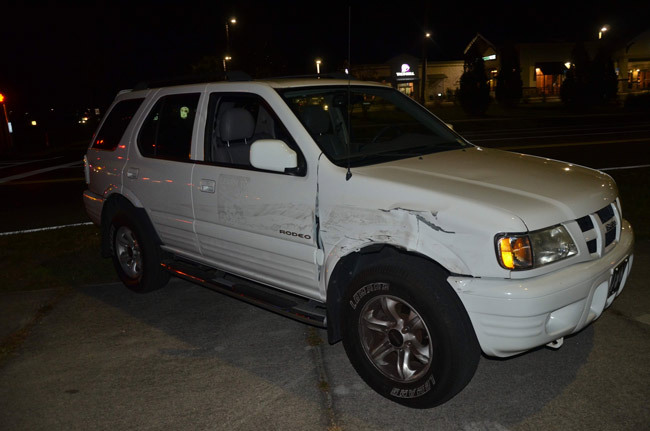 The driver of the SUV stated he had the green light. The biker was in critical condition wonder if he gave a statement. I’m going to guess not. For those of you who have instantly assumed the driver of the SUV is telling the truth. I caution you that I have witnessed people taking a left hand turn while light is red. Yes the driver of tthe SUV may of blown the traffic light. The biker may of blown the traffic light. WE don’t know lets not rush to judgement . As far as the comments on the bureaucrats goes. WE THE PEOPLE OF THE USA have lost trust in government. And finally to Willy Boy I was seriously injured in an accident. I was taking to St Mary’s Hospital in Langhorne, Pa due to my multiple traumas I was transported to Penn University in Philadelphia. Not all Hospitals have the staff to treat certain traumatic injuries. Lets us pray that all involved in the accident heal. I happened to be heading down to the fishing pier and witnessed the biker being lifted onto the stretcher very sad. Its the reason i was searching to see if he lived. May he heal quickly and recover fully. God Bless and peace be with you all. Jim Walker. @ Willy Boy, not the hospital 2 miles away. They’re not set up for trauma. They fly to Halifax Hospital in Daytona. So simple, the rider of the bike, speeding , ran a red light and he got what he got. Maybe this mistake on his part will cause him to slow down when he fully recovers. And like poster Really noted, “I see that from motorcyclists every week” such a true statement. Young people on rice rockets speeding and weaving in and out of traffic, I’m just surprised we don;t have more dead young bike riders that ride carelessly with no care in the world about themselves or the people around them. Our wise leaders had the foresight to allow the only hospital in the county to be built without a trauma center or a maternity ward. Have you been to that hospital? Definitely not a good place to go when in need of serious medical attention. I agree with Really…. not only slow down, but simply stop. I would love to see fcso posted at Belle Terre and Cypress Parkway for one morning and one afternoon. Nobody and I mean nobody stops to turn right onto Cypress ….they just act like it’s a yield. Does anybody come to a complete stop in the city anymore?